Most of the photos taken of Saturn these days are in drab black and white. But this infrared view of Saturn from NASA’s Cassini spacecraft is a stunning reminder of this ringed planet’s spectral vibrance. This false-colored image of Saturn was produced by Kevin M. Gill who, in addition to serving as an engineer at NASA’s Jet Propulsion Laboratory, is an amateur space imaging enthusiast. 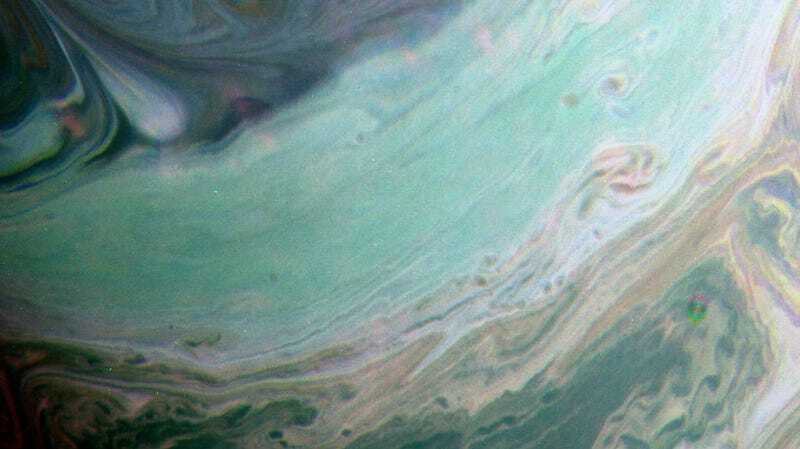 The photo was captured by Cassini’s wide-angle camera on July 20, 2016, which is capable of capturing infrared light at 750, 727, and 619 nanometers. In plain English, it’s a visual spectrum that helps scientists measure the depth and structure of Saturn’s cloud structure, while also showing us how this gas giant absorbs and scatters sunlight in its methane rich atmosphere, among other phenomena. Why Don’t You See Any Stars In Pictures of Saturn? Why on Earth Are Saturn’s Rings Crossing Each Other?